It’s been eight years since the last Mega Man game, and after the disappointing spiritual successor Mighty No. 9, it’s fair for us all to wonder: Is Mega Man 11 actually going to be any good? The answer, from what I’ve played so far, is yes. 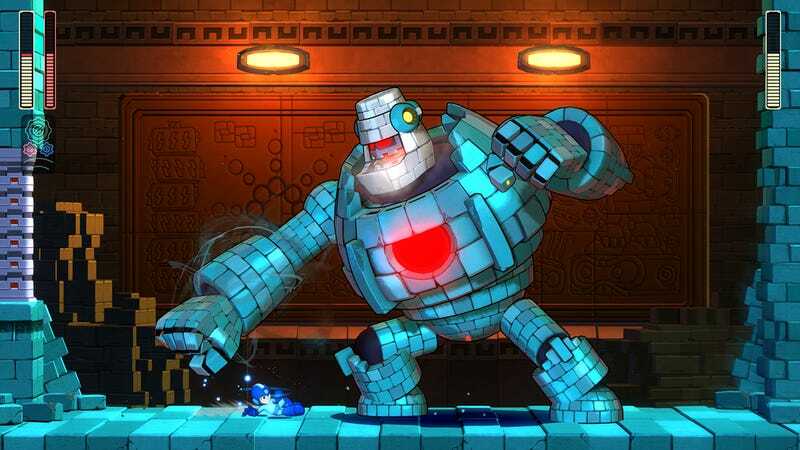 I played two full stages of Mega Man 11 (out October 2 for PC and consoles) at Capcom’s E3 booth yesterday, starring Block Man and Fuse Man, and am pleased to report that the game feels wonderful to play. It’s challenging but doesn’t seem cheap, taking the tough platforming that worked so well in old-school Mega Man and adding a level of polish that you’d expect from a 2018 game. When I did die, it wasn’t because of clunky physics or a death-trap that I’d have no way of knowing about, it was because I wasn’t good enough. Fuse Man’s stage is electricity-themed, full of zappers and timed jumps, and ending with a traditional (and simple) boss battle. Block Man is more elaborate. His stage is gorgeous, with hulking stone pyramids lurking in the background, and full of tough platforming and plummeting blocks. When you fight him, he’ll catch you off guard, transforming into a monstrous stone giant halfway through the battle. Unlike previous games, Mega Man 11 has difficulty settings, allowing you to choose between Newcomer, Casual, Normal, and Superhero modes. A Capcom rep told me that these will affect 1) how much damage you take and 2) how many checkpoints you get. When you’re playing on Newcomer, they said, you’ll also have infinite lives. The Blue Bomber has a couple of new mechanics, too. Charged shots are back after a long absence, as is sliding. There’s no wall-jumping or dashing, but Rush is now assigned to a button, which is absolutely brilliant. Instead of navigating cumbersome menus every time you want to get a vertical boost, you can just press Triangle to summon Mega Man’s trusty robotic dog in exchange for some energy. Then you can jump on him to leap up high in the air. You also have access to what the game calls Gear abilities—temporary power-ups that you can conjure for limited periods. There’s the Power Gear, which strengthens your cannon attacks, and then there’s the far more useful Speed Gear, which allows you to slow down time. Turning on each of these gears starts filling up an energy meter—use it for too long and the energy meter will burst, making you wait a while before you use either gear again. When you turn it off, the meter will gradually drop back to normal. Mega Man purists may want to ignore these new tools, but they’re helpful ways to get an edge during some of the fast-paced boss battles and platforming obstacles that are sprinkled throughout the game. It’s always tricky to get the measure of a game based on an E3 demo, but Mega Man’s structure—each game is divided into eight main stages, plus a final area—actually makes it easy to judge. The slices of Mega Man 11 that I played yesterday felt as final as they could have been. And what I played in both Block Man and Fuse Man’s levels was the type of tricky platforming, smooth jumping, and delightful blasting that I would want from a brand new Mega Man game in 2018. This is one to watch.